Scientists at the University of St Andrews have used lasers to simulate a black hole in their laboratory. Professor Ulf Leonhardt and Dr Friedrich König used intense light pulses to create an artificial `event horizon' - the defining feature of a black hole known as `the point of no return'. The development may allow researchers to test Professor Stephen Hawking's theory that black holes are not black at all but in fact radiate light. It is the first time that scientists have successfully simulated an event horizon using light. There is no danger however of the scientists being sucked into deep space by an intense pull of gravity, since the tabletop device only acts on light in optical fibres and is perfectly harmless. The St Andrews demonstration of the physics behind the event horizon, in which they measured the shifting of light, has been described as a `milestone'. The researchers accomplished the feat by firing laser light down an optical fibre - with different wavelengths of light moving at different speeds, creating a distortion which causes a wave of light to be trapped - effectively a black hole event horizon which cannot be escaped. The `fibre-optical black hole', created by the St Andrews team on a shoestring budget, could allow physicists to investigate what happens to light at both sides of an event horizon - something they describe as a `feat that is utterly impossible in astrophysics'. Describing the study as a `scientific adventure and formidable challenge', Professor Leonhardt, of the University's School of Physics & Astronomy, said, "Creating optical analogues (simulations) of the event horizon has been an exciting adventure with many ups and downs, high hopes and deep disappointments, an adventure that seems destined to continue. So far, most of it is still theory, but we succeeded in the first small step of demonstrating in the laboratory the physics of horizons for light. "We used ultrashort light pulses in microstructured optical fibres to demonstrate the formation of an artificial event horizon in optics. We have created analogues of the horizon - not real black holes - that only act on light in the fibre, and we observed a classical optical effect, the blue-shifting of light at a white-hole horizon," he said. Previous researchers have compared a black hole event to a river flowing towards a waterfall. A horizon (point of no return) is formed at the point where the river moves faster than the speed of the waves. Instead of water, the St Andrews researchers decided to use light because it offers unrivalled advantages; light is the purest and simplest quantum object imaginable, creating fibre-optical horizons of pure glass, light and air. The researchers say that event horizons are not hard to create and that making a long-distance telephone call can create them without callers even noticing. "You can simulate an event horizon in the kitchen. Just let water from the tap flow onto a flat surface until a ring of water waves appears - the water inside the ring is smooth and moves faster than the waves around it, making it impossible for the waves to enter the ring. Instead, the water flows outwards and gets slower. Rings of waves form at the circle where the water slows down to the speed of the waves. This circle represents a white-hole horizon," explained Professor Leonhardt. 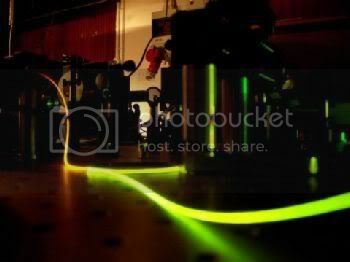 "It happens all the time in optical telecommunications where information is carried by light pulses which change the speed of light - whenever people communicate via fibre optics, using the internet or making long-distance phone calls, they create numerous artificial event horizons as a side effect without noticing it. The front end of each pulse generates a black-hole horizon, an area that light cannot leave, while the trailing end acts like a white-hole horizon, an area that light cannot enter," he said. The research, published tomorrow by Science, was funded in an unusual way - Professor Leonhardt's cousins, two German businessmen, provided backing to start the study, with further money more traditionally granted by the Leverhulme Trust and the EPSRC (Engineering and Physical Sciences Research Council). » Forget Black Holes, How Do You Find A Wormhole?